It has to be said that ‘me missus’ does not exactly go for the combination of mountains and snow, and my day playing on the Glyderau (see post #242) would have been Chris’s idea of a ‘day from Hell’. 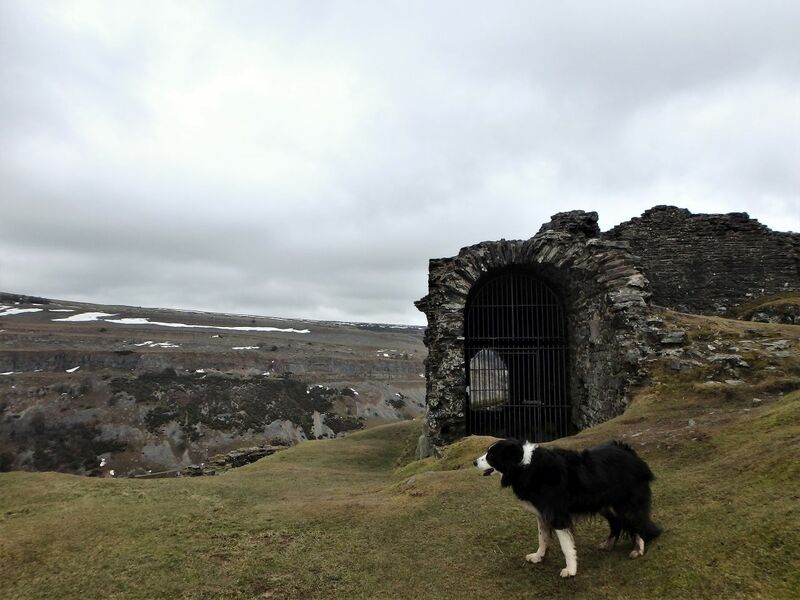 However, there are plenty of quality outings in North Wales that give a good day out without me ending up in the dog house, and I’ve had a recent project looking for easier walks to suit the two of us. 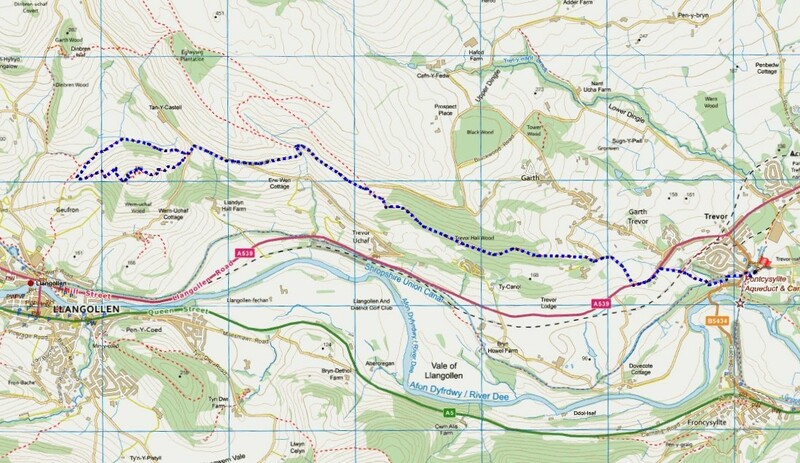 The Offa’s Dyke Path is a suitable contender, as it runs to within a few hundred metres of our house, and we seem to be completing sections of the Trail by default. 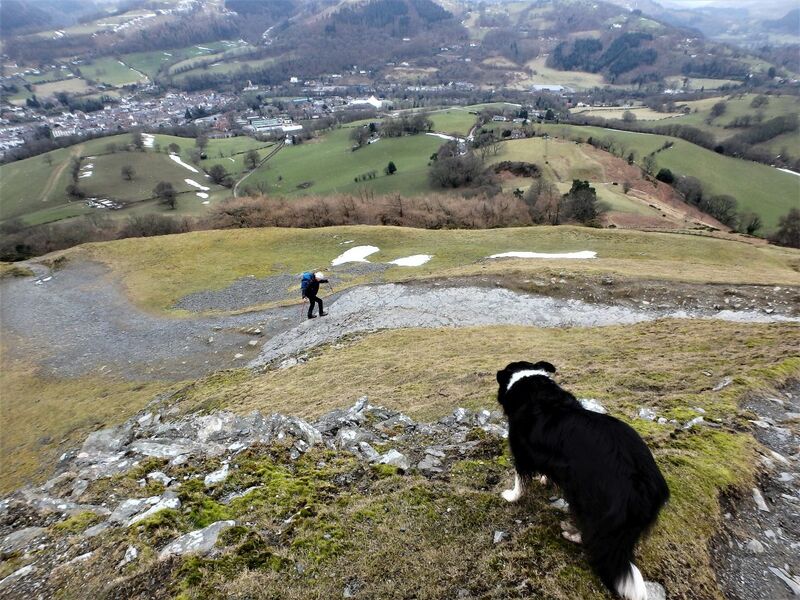 The traverse of the Clwydian Hills is probably the highlight for most walkers on the ODP and is great dog walking country, so Border Collie ‘Mist’ is also guaranteed a good day out. 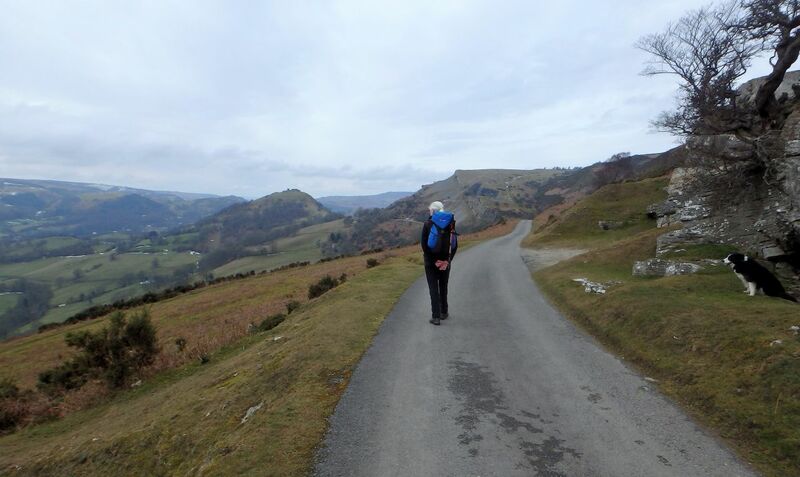 Sometimes, though, a change is as good as a rest, so within a couple of days of my Glyderau trip, we were over in the Vale of Llangollen. 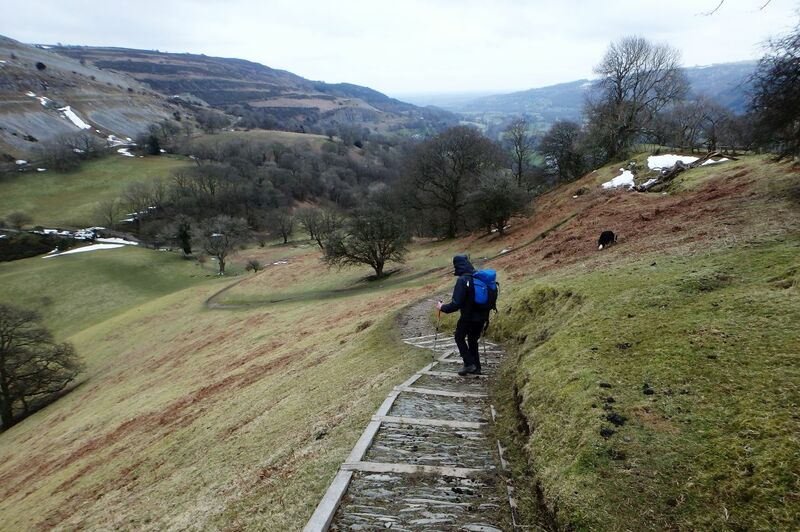 We were following a section of the ODP from the Pontcysyllte Aqueduct towards the Panorama Walk above the town of Llangollen. 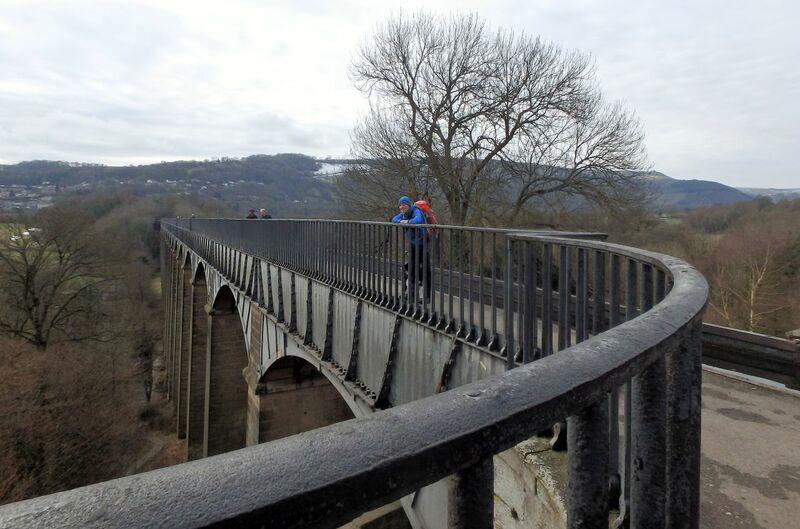 Our start point was one of the engineering triumphs of its day – completed in 1805, the 1000 ft (305 metres) long aqueduct carries the Llangollen Canal over the River Dee (Afon Dyfrdwy) flowing 126 ft (38 metres) below, and in 2009 it was declared a UNESCO World Heritage site. The canal itself never made much commercial sense, and was all but abandoned by 1939, but it still fulfilled a useful role by feeding water into other working canal systems. 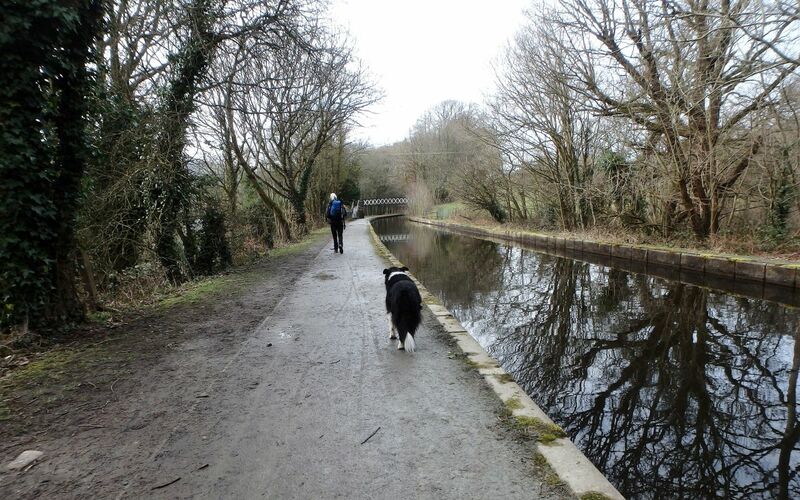 Unofficial use of the canal for recreational cruising began after WW2, and in 1968 the future of the canal was guaranteed by the Transport Act of that year, which conferred the status of a cruiseway. It’s now one of the most popular recreational waterways in the UK. 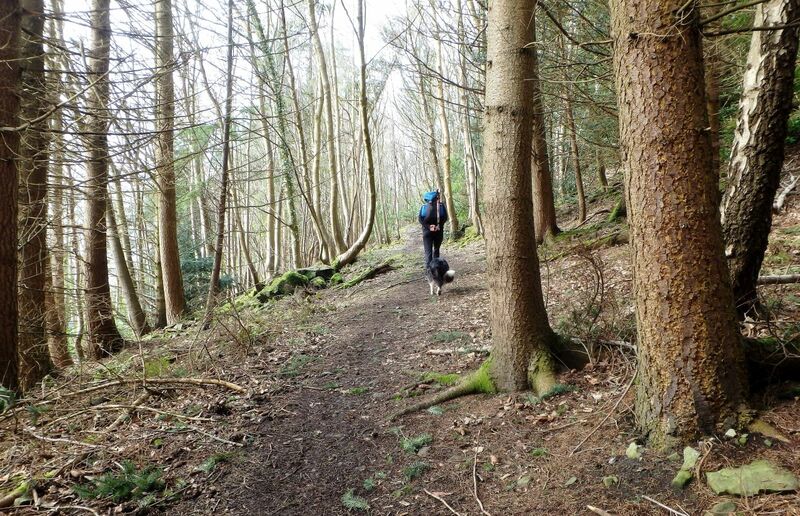 Through the woods on the Offa’s Dyke Path …. …. 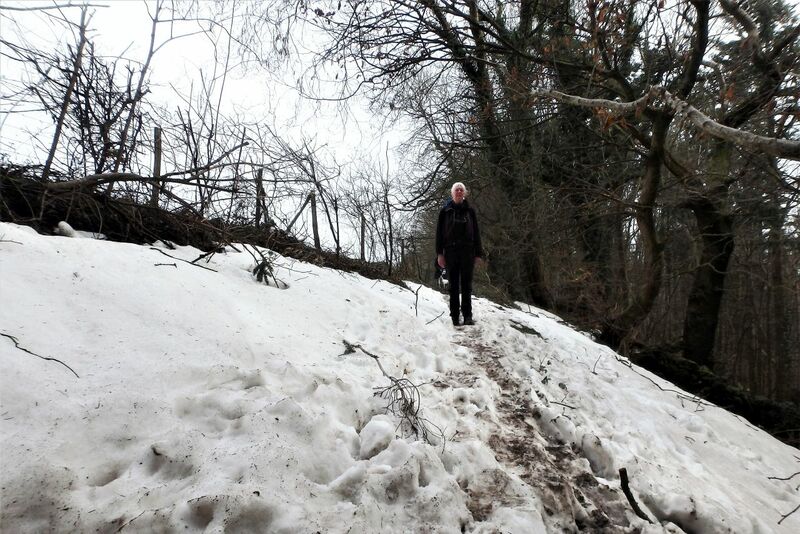 with a lingering patch of snow to keep Chris amused – or not! 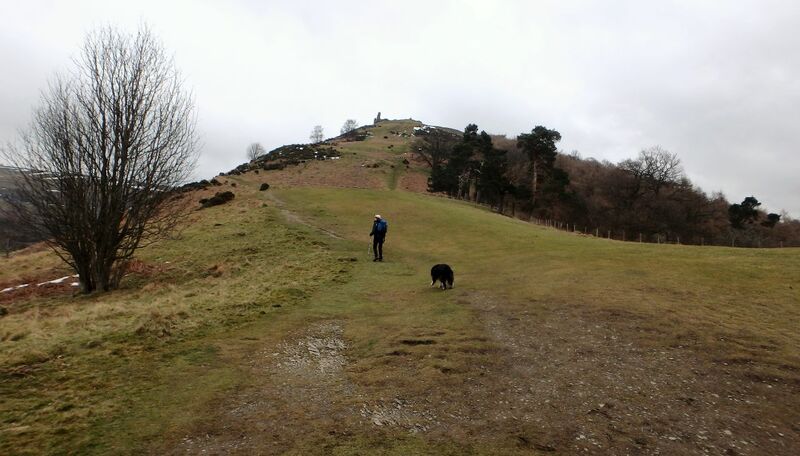 Our start point at Trevor Basin was a mere 400 metres from the ODP, and we soon left the canal behind to head up through Trevor Hall Wood. 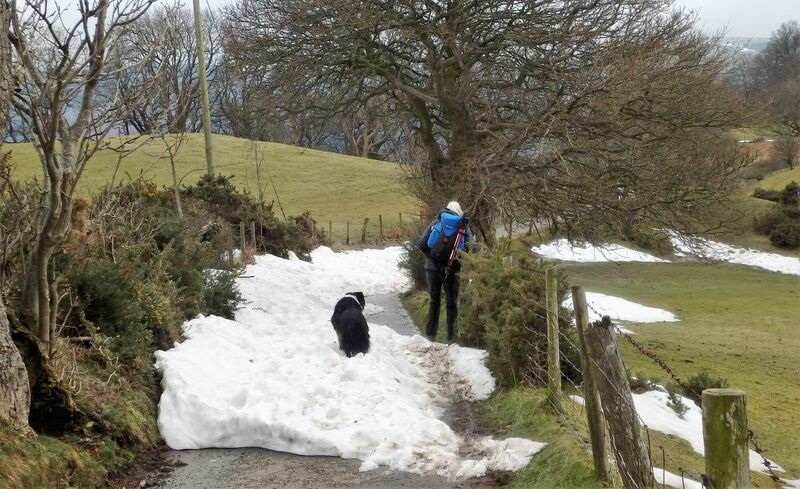 The mountains of the Glyderau hadn’t held much snow on my other trip out, but the lowlands of the Vale of Llangollen still had hidden snowfields, relics of the heavy snowfalls a week earlier – Chris wasn’t much impressed but ‘Mist’ loves playing in snow, so most members of the party were happy. 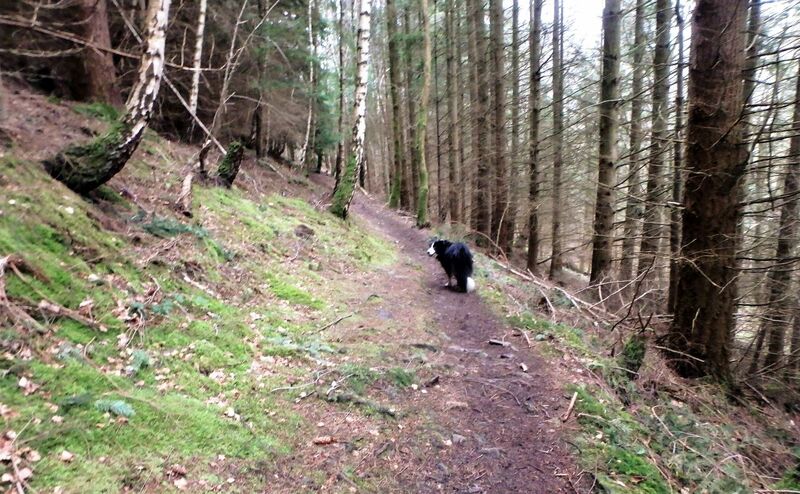 The ODP finally emerges from the woods to reach the Panorama Walk near Trevor Rocks. 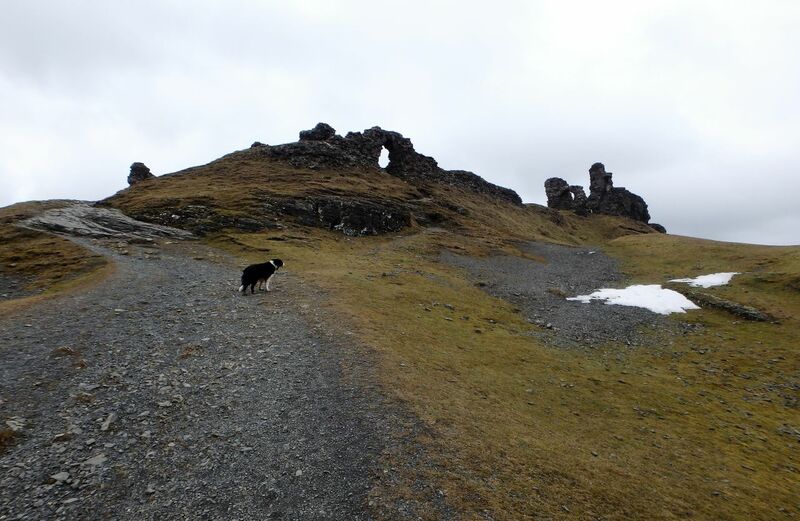 The rocks continue on to Creigiau Eglwyseg and eventually ‘Worlds End’, forming a spectacular band of limestone crag which in places gives good ‘trad’ rock climbing. 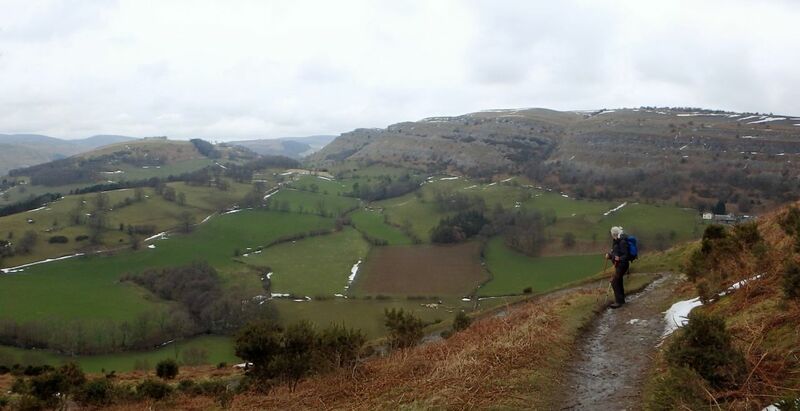 The view looking in the other direction gives a great outlook over the Vale of Llangollen, where one of the stars of the show is the ruined castle of Dinas Bran. 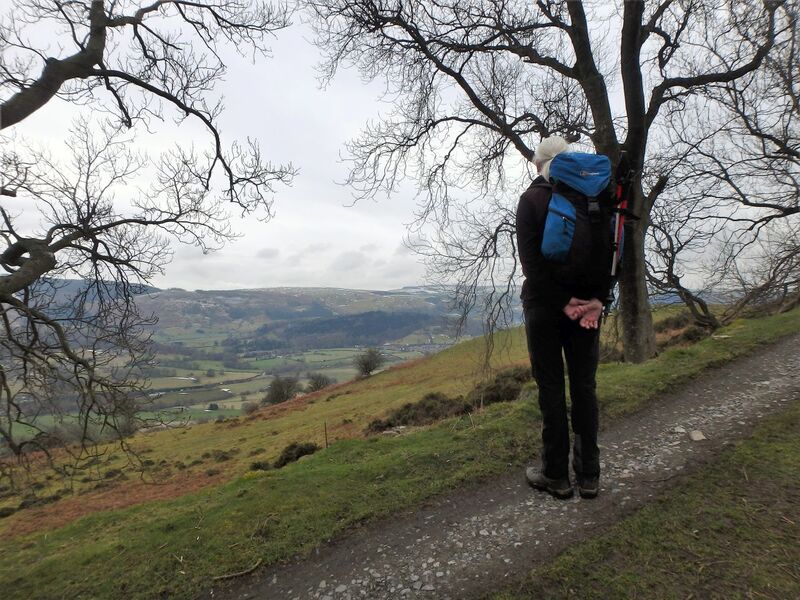 The Panorama Walk is mostly on a quiet tarmac road, but traffic is almost non-existent and the views over the Vale made a change from the confines of the wood. 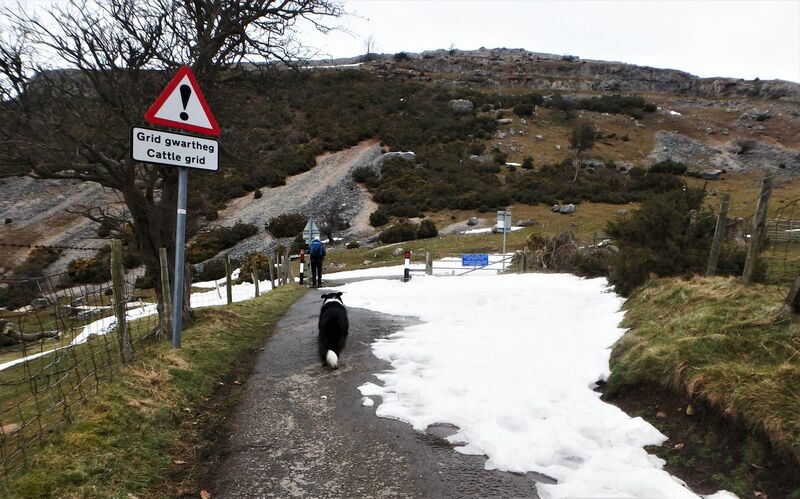 The plan was to head for the far side (west) of the castle before crossing over the top of the hill to follow the east side down – on the way, we managed to find another big snowdrift, this time blocking the lane from Trevor Rocks down to Llangollen town. The 1260’s were certainly troubled times. 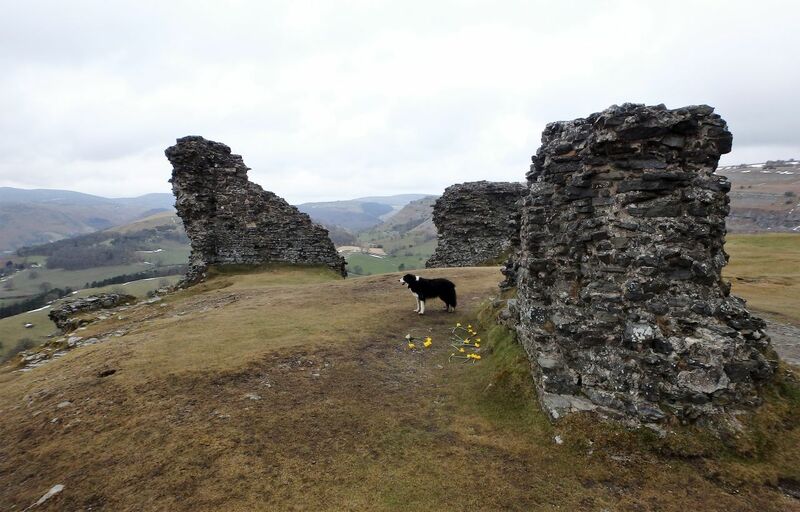 The lord of the castle was Gruffydd II ap Madog of Powys, an ally of Llywelyn ap Gruffudd, Prince of Wales. 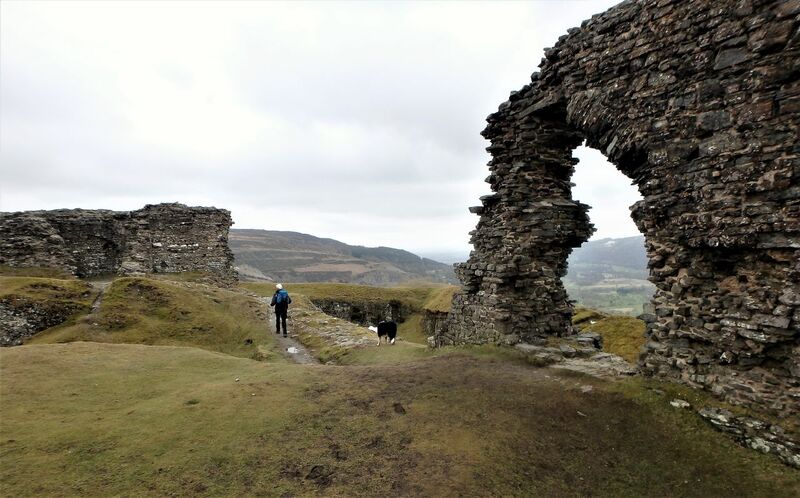 Powys was of use to Llywelyn as a buffer state between England and his power base of Gwynedd and Dinas Bran was one of several castles built following the signing of a treaty which secured Wales for Llywelyn, free from English interference. The peace did not last long and in 1276 war was re-started between England and Wales. 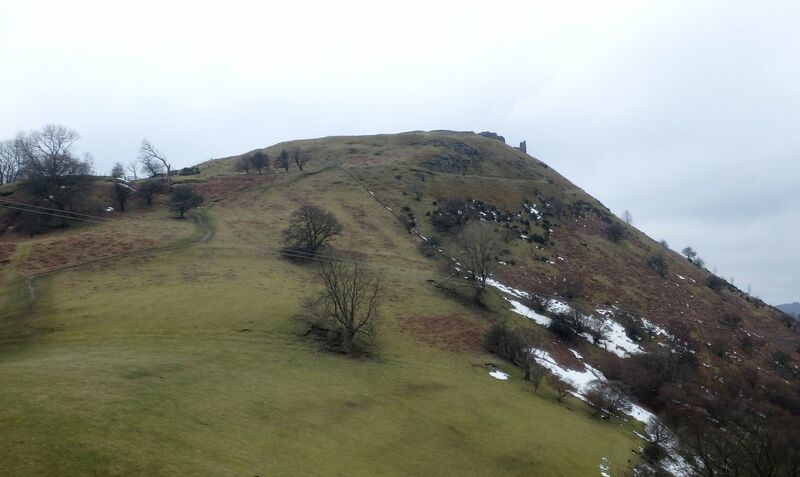 Edward’s larger armies soon invaded Wales and the support for Llywelyn crumbled. 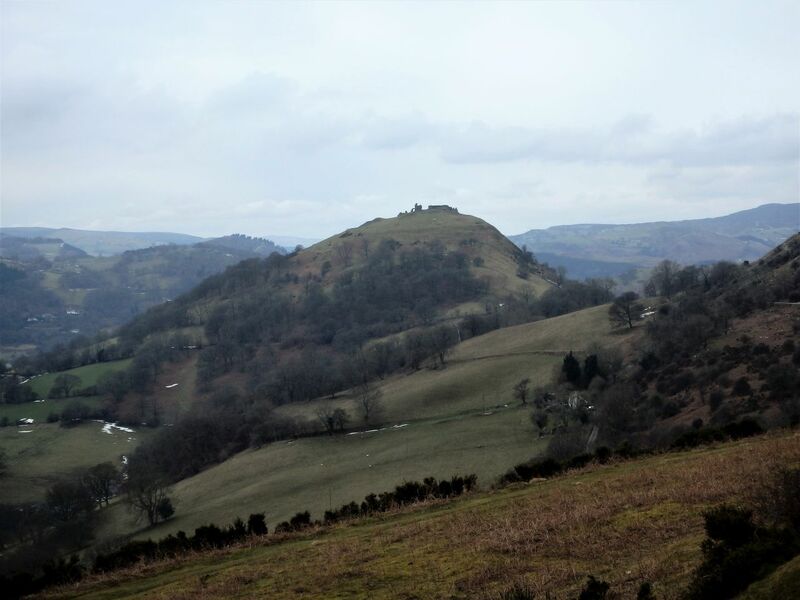 As the English advanced, the defenders of Dinas Bran set fire to the castle, possibly to prevent it being of use to the English. 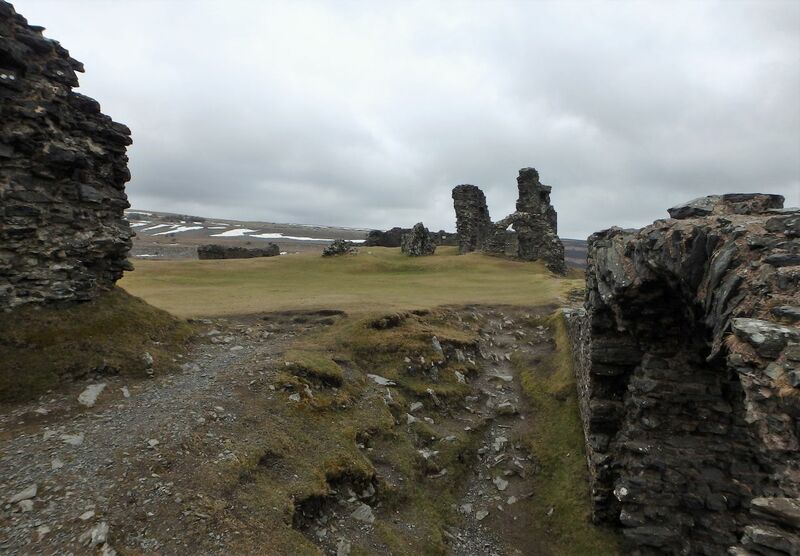 The castle may have been recaptured by the Welsh in the final conflict of 1282, but eventually the English were victorious. 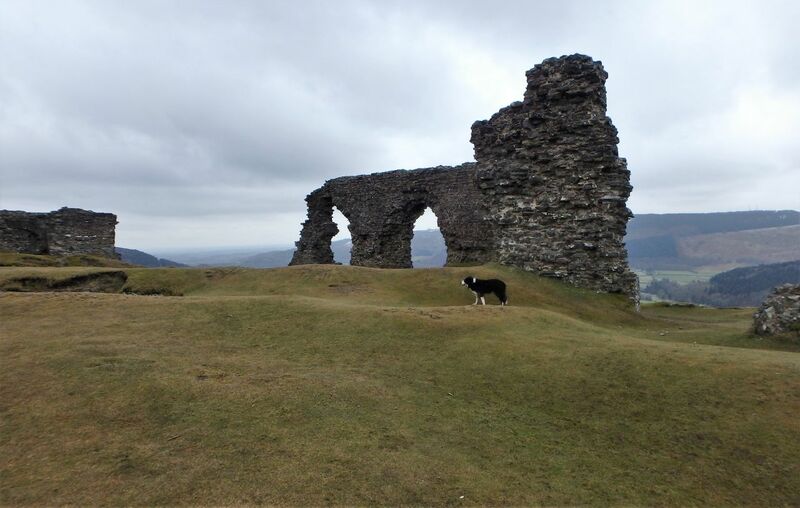 Following the end of the war and the death of Llywelyn, Edward granted the castle to John de Warenne, Earl of Surrey, who abandoned Dinas Bran in favour of a new castle at Holt on the English-Welsh border, leaving Dinas Bran in ruins. 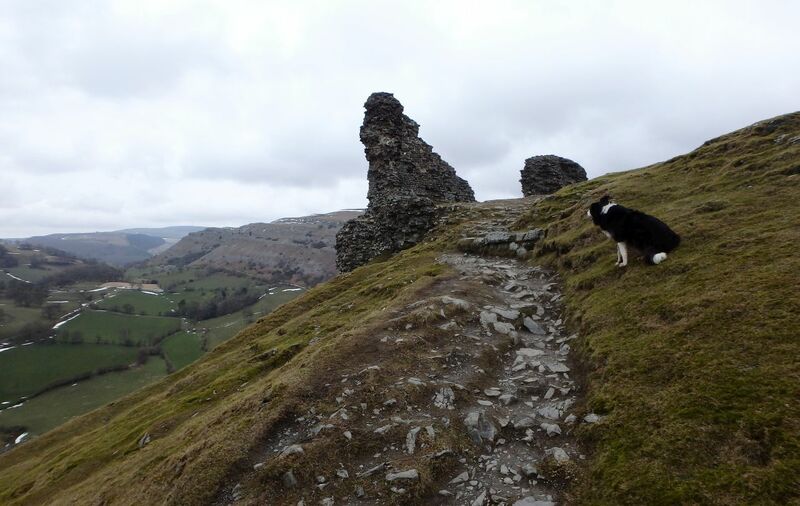 We had a good wander around the ruins, but the castle wasn’t the end of our day, just the halfway point. 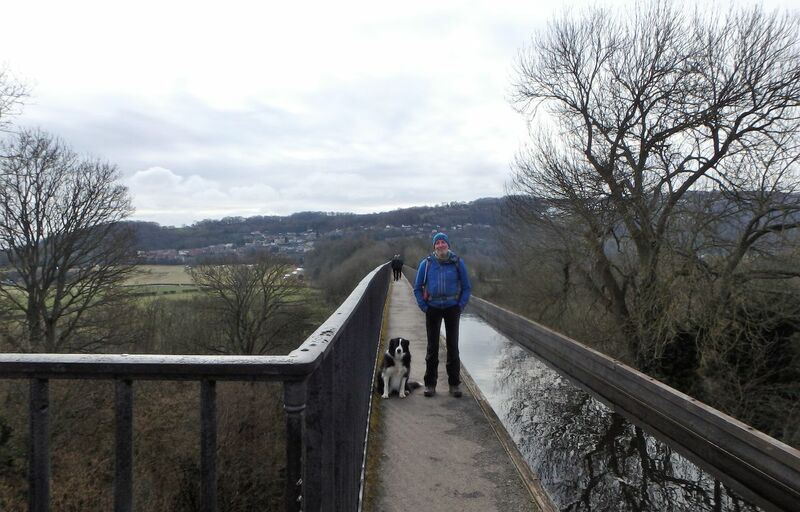 We took the east slopes of the hill for our descent route and were soon heading back to Pontcysyllta by our outward route, much to the relief of a hungry Border Collie.